With almost 30 years of experience in the plumbing and heating trade, you can trust in Paling Plumbing and Heating Ltd to deliver workmanship of the highest quality each and every time you use us. Whether you require work carried out on unvented hot water systems or your central heating is playing up, we are the company to call! We are happy to undertake all plumbing repairs from a leaky tap to complete new central heating system. For more information on the services that we can provide or to book an appointment with our heating engineer be sure to give us a call. Our company has been trading for 15 years and we are as committed as ever to delivering quality services at competitive rates. 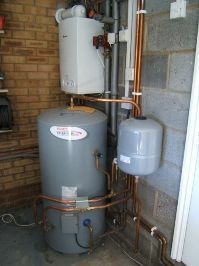 For Combi boilers in Mexborough, call Paling Plumbing and Heating now! Paling Plumbing and Heating Ltd is here to provide plumbing services including the installation and maintenance of unvented hot water systems, central heating and Combi boilers in Mexborough. We welcome all further enquiries, so please do not hesitate to get in touch and a member of our dedicated team will be happy to help in any way they can.